The Toyota Highlander has always stood out in the crowded third-row SUV segment. Its solid reputation for a comfortable ride and dependability has always made it a fan-favorite. Our Knoxville, TN customer have always liked its easy handling and quiet cabin experience. The 2019 Highlander continues these traditions and looks to continue to be a major player in the SUV game. Rusty Wallace Toyota, located at 5944 West Andrew Johnson Highway in Morristown, TN, is happy to offer our customers a large inventory of new Toyota vehicles. Look through our new vehicle inventory and find the Highlander that works for you. The new Highlander features two engine choices: the standard 2.7-liter inline-four (I4) cylinder and the available 3.5-liter V6 direct-injection engine. The V6 engine is paired with a Direct-Shift eight-speed automatic transmission to provide a nice blend of smooth, but powerful acceleration and efficiency. The Highlander is a good fit for our Sevierville, TN customers who want to tow their boat. This SUV tows a maximum of 5,000 pounds. The available Stop and Start Engine System turns off the engine when the brake pedal is depressed, and the vehicle is idle. This helps with fuel economy. This vehicle comes available with Dynamic Torque-Control All-Wheel Drive to provide better control and traction in difficult road conditions. The Highlander can seat up to eight people and provides maximum comfort for your passengers with available heated second-row captain’s chairs. The third-row seats recline, and the famous quiet ride of the cabin continues with noise cancelling technology reducing the ambient noise. Greeneville, TN customers will be happy to know that there is an available 83.7 cubic feet of cargo volume. Our Newport, TN customers who like luxury will enjoy the available panoramic moonroof and Blu-ray Disc™ entertainment system for those long car trips with the family. Buying, or leasing, is a big decision and our finance team has the knowledge to help you make the best decision for your situation. 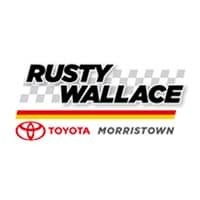 Rusty Wallace Toyota, in Morristown, TN, has many lease specials, financing promotions, and incentives on our new vehicles and they expire monthly. Contact our finance team and find out which ones apply to you. Start the process of buying or leasing your 2019 Toyota Highlander today. If a new vehicle is not exactly in your budget then be sure to check out our inventory of used SUVs at our Morristown, TN dealership.